Your closet is a tight fit and what helps it breathe is that you store a lot of your seasonal storage there in your portable storage closet, in addition to your overflow of jackets, sweaters and dresses. 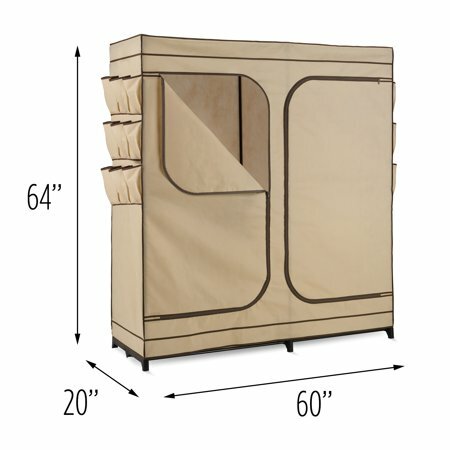 This closet system is breathable and its lightweight fabric protects your items from dust and debris. Additional exterior storage pockets are perfect for sandals and other small accessories. I think it's a nice storage closet for the money. It's easy to set up - I did so quickly and efficiently by myself in my kitchen (and I am HORRIBLE at assembling things!). No tools are required. The material for the closet is nice, but if you rush things, I'm sure you probably could tear it by not being careful. I have assembled these in the past, so I had some experience and knew what to expect. This was nicer than I expected and the material isn't as flimsy as I thought it would be. It will work well for what I need it for (which is actually as a cheap linen closet to store bedding and such in it). As a closet, I don't have any qualms about the fact that it would be able to store a moderate amount of clothes. It seems pretty well made and the joints are pretty solid. I wasn't overly rough putting it together, but I wasn't exactly gentle either. Nothing broke and nothing tore, which is more than I can say for previous experiences I've had with other brands of these style closets. You honestly get what you pay for with these things. They're a cheaper but efficient way to store clothes and other items. They look pretty nice, and if you take your time assembling them, they go together rather easily. I would definitely buy more of these again (and may actually do so here soon). The size is just what I needed. I found it difficult to put together at first but, I finally figured it out. I tore the lower right corner putting it on the frame and one of the zippers came off. However it will do what I need it to do. I can always count on you to give me a deal! This closet went together quickly with only 1 minor hick up - the hole for the bottom center in the back was off by a few inches but since the fabric is so thin, it ripped and allowed everything to fit together. Yeah, I lost some of the "dust free" feature but it works! One thing you should be aware of is there is NO FLOOR STORAGE. The bottom fabric sits a couple inches off the floor and is not sturdy enough to hold any weight. Needs to have a middle bar for low hanging items. There is a hole for it but no pole? Material is much thinner than what it looks like, almost paper like. Not worth the original price but I got it on sale, which is more in line with the value. Otherwise great concept, lots of room and easy to assemble. I purchased this item to assist with my move to a new house. It was easy to assemble, although the cover tore while putting in place. A second set of hands would be helpful to put cover in place. The storage is ample so I like the item. Hello,<br />We apologize for the problem you had with the cover to our storage closet. Would you mind letting us know where the cover tore? Any feedback you can share will greatly help us improve the construction and assembly of our storage closet. Thank you again for taking the time to review and to share your experience. I like how this product looks and set up was not problem. This product does not stand up to as company claims "heavy steel"! Yes, rods are steel but there is plastic joints, which is a problem. I needed for my heavy winter cloths and now it is almost going to fall apart soon from the center. I would suggest company should make steel joints, then it would be much better product and I would pay $5.00 more. The product is pretty flimsy. Don't put much weight in it or the plastic rod or bracket will break. They need to make the rod and brackets or braces out of a stronger material like metal. The plastic doesn't hold up. The fabric it is made out of tears extremely easy, very lightweight. Wasted my money and time! A friend and I spent an hour putting this together on a Saturday morning. Sunday morning it looked as though it was leaning so I took out some of the clothes to see if it was 'top heavy'. By Tuesday night, it only had t-shirts and casual wear. None of the coats or winter items that I'd planned to store in it. A/b 4a on Wednesday morning, the whole thing crashed down and scared the heck out of us all. Dogs barking, cats hissing - horrible way to start a day. Obviously, it took me less time to put all the parts in the box but maybe three hours in all. This includes the return though which I must say was seamless. I popped online, printed out a return receipt and went to the local store to get my money back. The easy return is the only reason there is a star at all. Do NOT purchase this horrible product!! This product was one of my worst purchases ever!! At first, after I assembled the wardrobe I thought it was adequate, and it was for about 7 months. I take care of my things and in no way abuse them. One day I simply unzipped the wardrobe door and the whole door just ripped open. The next day the other door ripped. Each time I opened or closed a door more rips formed, and in close succession all sides began to rip at the slightest touch! The fabric was literally disintegrating! The wardrobe was never in direct sunlight yet the pieces of material that compose the shell are now not even as strong as a piece of paper and turn to dust upon contact!! All that remains are hanging seams and the framework and I have a huge mess. I am seeking a refund and Walmart tells me I must contact the manufacturer. Do NOT purchase this horrible rip off product!! 2. There is a cloth bottom, just like the rest of the material. But no hard/solid floor. 3. 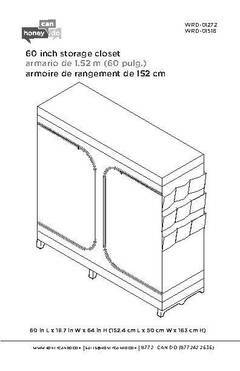 Hi, what it means by no bottom its that there is not a hard bottom for u to put shoes or other things but the frame of this closet is fully closed so your clothes are enclosed in the frame. 4. There is material across the bottom, like a tarp. 5. No bottom at all. 7. There is a bottom and it will hold whatever. And the clothes are fully enclose. 8. There is a bottom. But the material is even thinner than the sides. You definitely wouldn't want to put anything inside on the floor. The material is so thin that it ripped while putting the item together. 9. The fabric cover completely encases the hanging clothes; however, the fabric floor is very flimsy and wouldn't support storage of any items laid on it. 10. There is no floor, or shelf. The cover does fully enclose the clothing. Are there any shelves inside??? 1. There are no shelves inside. 3. Hi, there are no shelves inside, its just for hanging clothes. 5. No shelves at all. 8. No there are no shelves inside. Their are just shoe holders on each side. 9. No there is no shelves. But there is room in the bottom to hold whatever. What is the outside material made of (i.e. plastic or fabric)? 2. This product is made from fabric. 3. Canvas fabric... nice looking but be careful so you do not tear it during the assembly. If you are planning to put a lot of weight (clothes can weight a lot) you are better off getting 2 of the small ones. I had one and the middle big brace (plastic) that hold the pole where you put the hangers broke - from the weight of the clothes. I ended up buying 2 small closets. 6. It&#39;s made of canvas material.